A Dutch painter who worked mostly in Haarlem, Amsterdam and also in The Hague, Berckheyde was well known for his scenic depictions of architecture. His works are described as detailed and accurate, with a skillful eye for the natural effects of lighting and shading. He was largely influenced by his brother and first trainer, Job Adriaensz Berckheyde (1630 – 1693). While Gerrit painted primarily architecture, Job also painted the more common genre scenes (everyday life) and religious subjects. Together, the brothers traveled Germany, seeing Cologne, Bonn, Mannheim and Heidelberg. They toured along the Rhine River and found patronage in the court of an elector, Charles Ludwig of Heidelberg. Berckheyde did not stay long and returned to the city of Haarlem, where he eventually became a master painter in the Guild of Saint Luke. It is said that the brothers opened a studio together in the Haarlem. Berckheyde’s painting was greatly influenced by another architectural specialist in Haarlem, the Dutch painter, Peter Jansz Saenredam (1596 – 1665). 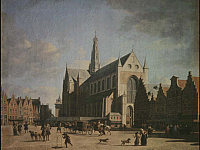 Where Saenredam focused mainly on Church interiors, Berckheyde preferred wide open exterior spaces, showing large monuments. An excellent example of such is his piece, The Groote Markt in Haarlem, from 1693, now in the Uffizi Gallery. There is another view of The Groote Markt in Haarlem, painted in 1673, as well as his View of the Rathuis in Amsterdam, from 1670 now in Saint Petersburg’s Hermitage Museum. A number of his works are still in Museums in Haarlem and throughout Amsterdam, but also in London, Cambridge, Australia, Madrid, Dresden and in the United States.